This entry was posted in Comments about Cycling on December 1, 2015 by Steve Tilford. On the spur of the moment, over Thanksgiving, I ordered some “sports breathing technology”. I was on Amazon and ordered the Rhinomed Turbine starter pack, which has small, medium and large things that go up your nose and supposedly hold your nostril open while exercising. I really can’t breathe much out of my nose. Even after I did sinus surgery a few years back. It really didn’t seem to help all that much. I guess I have a long nose and the cartilage had broken down so much that when I breathe, my nose sort of collapses and blocks itself. I did the surgery mainly for sleeping. I believe breathing through your nose while sleeping is much healthier than mouth breathing. I can barely manage it most of the time. This isn’t the first time I’ve tried some sort of “technology” for breathing. I tried Breathrights for a bit. I only raced with them once. I was doing a World Cup MTB in Australia and rode a couple times with them. So I decided to race using them. Within the first minute, my breathing sounded like a squeaky door each breath. It was so annoying that I pulled the thing off after just a few minutes. I’m not sure what the noise was. Must have been a deviation of air from normal air flow. Whatever the reason, it might have been more air, but that didn’t work. I’ve used the Rhinomed Turbine twice now. It doesn’t seem to bother me that much, but it looks stupid. Kind of like a nose ring. 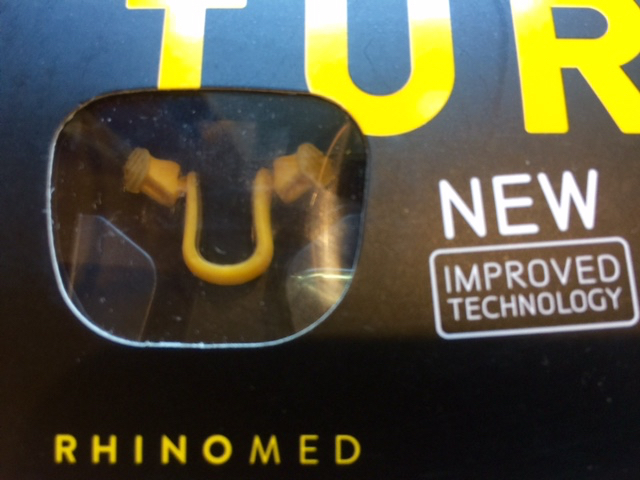 A yellow nose ring. But looking stupid doesn’t mean it shouldn’t be used. Athletics, at least endurance athletics is all about air. More specifically oxygen. The more you can use, the better you generally are. So getting more air into your lungs, easier is a good thing. But I ‘m not sure cycling involves a ton of nose breathing. This might be better for sleeping, I don’t know. I haven’t played around that much with it to know what its ultimate function might be. And I’m not sure I am going to. Anyone out there, other than Chris Froome, use one of these things. Any pointers? 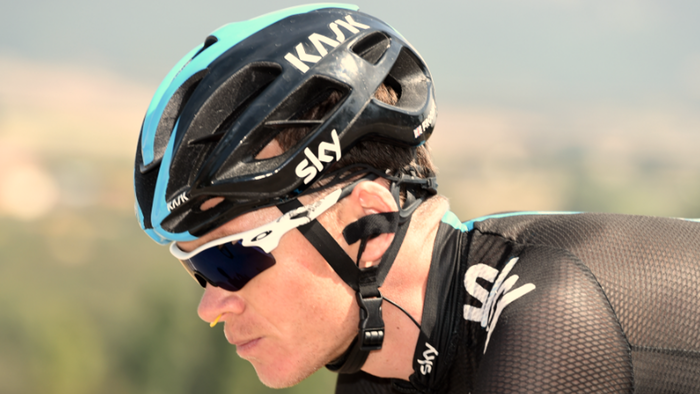 Chris Froome wearing the Turbine nose thingy. The starter package comes with three sizes. Air intake is not the limiting factor in endurance athletics. Gas exchange (i.e. oxygen transfer in the lungs) and distribution (i.e. circulation) are the bottlenecks (Air in = 21% O2, Air out = 16% O2). Breathed air still retains significant levels of oxygen (i.e. part of the reason resuscitation is sometimes successful), so any ‘technology’ used to increase air intake will have minimal (aka no) effect on performance. I’ve never used these, but have considered it. I also can barely ever breathe well through my nose. I’ve considered surgery for my deviated septum, but I kind of think the doctor is just selling me on it to try to make money off of me. Using them for sleep is an interesting idea though. I am a big time mouth breather when I sleep and imagine these could help me wake up less dehydrated if they work. I’ll be curious to hear your sleep results. During vigorous exercise you mouth breath because this is the path of least resistance. It takes much more work to breath through your nose, not too mention that it is less voulme brought in. Try nose breathing during a cross race and you will see that you can’t keep up (i.e. O2 demand/usage outstrips O2 intake). Ideal airway for athletics would be a tracheostomy, very little work of breathing, less airway resistance. This is often what allows people to be weaned from a ventilator after prolonged illness/coma etc. The Buteyko method or Buteyko Breathing Technique is a form of complementary or alternative physical therapy that proposes the use of breathing exercises as a treatment for asthma as well as other conditions. Must be Froome’s secret weapon. Something doesn’t really add up with him and other sky guys like Porte. Only mention that because I was just reading an old article with Porte bragging about how he and Froome were taking turns obliterating Armstrong’s record up the Madone climb in Monaco. Seems a bit off. I guess Danielson smashed it before the Sky guys did. Again, seems a bit off for guys that are clean. I’m a “mouth breather” and I believe the fact I breathe so poorly through my nose is why I don’t sleep well, or why swimming is difficult for me; I just can’t exhale through my nose productively. I tried Breathe Right nasal strips once. First night I wore one to sleep I had a placebo effect and slept incredibly well. After that night, nothing. I tried them cycling and didn’t notice much different. I might consider trying the Rhinomed product if they were available locally. I had surgery to correct a deviated septum. This was added on after I needed surgery to correct a severely broken nose, crown fracture to be specific. I suppose the success of the surgery is limited to the surgeon/patient. Some of the previous comments are correct. Unless you are at high altitude, the amount of oxygen you can take in is not a limiting factor for peak exercise, Our lungs are way overbuilt. You are more limited by the oxygen transport from the blood to your muscles and the ability of those muscles to utilize said oxygen. That’s why even during peak exercise, you can still have an O2sat of 99%. It’s also why EPO is such a performance enhancer (increases the blood’s O2 transporters). It gives you a way to transport and utilize the excess O2 that you normally can’t use. … and then, sometimes when out flying, you get just a little too close to the sun. And after doin that you never ever get a second chance….